Claire Bradford has got problems. Little does she know, they are about to get even bigger. First, her store has been burglarized along with some other establishments in town. Her inventory has been thrown all over the floor, money gone, computer stolen, and a designer wedding dress slashed and completely ruined. Hard to believe that Hope's Crossing, Colorado, a town of 5,000 people, would be hit with a crime spree. But this! This was, as author RaeAnne Thayne wrote, "blatant vandalism." Of course to make matters worse, the first person she sees is her ex's new wife. What an airhead! But frankly, she's the antithesis of Claire and perfect for the story! Second, back in town after after 15 years is Riley McKnight as the brand new chief of police coming in to save the day and solve the crime spree in the area. Sizzle is in the air, more trouble is on the way, and the Angel of Hope is at it again. With two kids and a store to run, what else can Claire endure? The worst possible thing in the world that will shatter the town, delivers a loss to the McKnight family, and possibly crush any chance for happiness for Claire. There is something to be said about this town with the word "Hope" in its name. Even more, there is something about this story that shows there is "hope" even during the darkest of times. Going through something horrible is the worst feeling in the world, but coming out on the other side a stronger, wiser person...well...that is the sweetest feeling in the world. The author, RaeAnne Thayne, delivers a well-thought out and believable story. I felt myself emotionally drawn in and a part of the plot. I could actually picture myself sitting in Claire's workroom sorting beads. 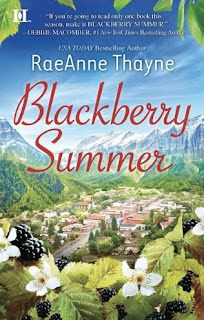 Blackberry Summer is the first in an entire series with characters from Hope's Crossing. Definitely worth reading and right up there with other series stories from authors such as Sherryl Woods and Debbie Macomber.